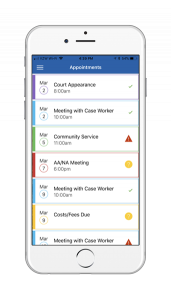 A module based participant information and management system, CourtFact is more than a smart phone application and far more than a simple supplement to case management software already deployed. Utilizing a simple-to-navigate software platform that is accessible on any device, agencies can enroll participants in a number of modules designed for efficient oversight of dozens or even thousands of program participants simultaneously. With options that are fully customizable from the agency level down to each individual participant, agencies can harness the power of their own policies and processes while adapting to the individual needs of each participant when warranted. With the ability to scale up or down instantly and each individual module is independent of the others, allowing agencies to employ any or all of the growing catalog of modules available. With optional interfacing with existing case management systems, importing and exporting of information is possible with our powerful API. 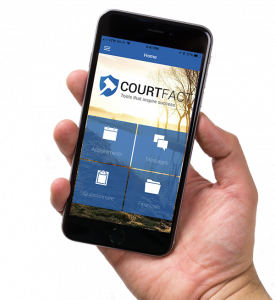 CourtFact truly puts Success in the Palm of Your Hand. 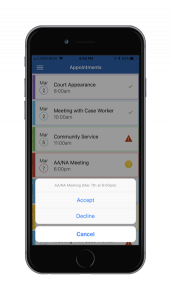 Each event type has its own color designation making it easy to quickly identify different types of events from both the agency’s online software and the client’s smartphone application. Every event created for clients requires the to accept or decline with an agency-customizable window. From the online software case workers can get visual notifications if events have not been accepted within that window or the reasons for them being declined. 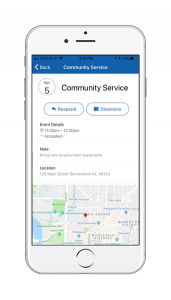 Using the Common Locations option in the web-based software or manually entering an address for an appointment or meeting, the client can access turn-by-turn directions to the location associated with each event.